We’re all for community. We begin by recruiting a peer supporter in a community that needs us. Our journey with a community begins by recruiting a peer supporter. 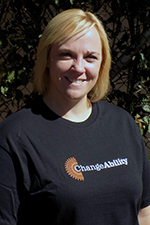 The peer supporter is a person living with a disability and willing to work with us for change. We currently work with four communities in the Cape Winelands. 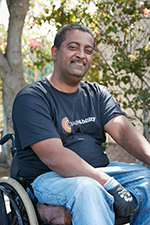 Gavin partnered with us to improve wheelchair accessibility in his community. He also pops a wheelie like a pro. 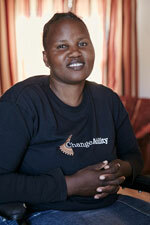 Lindiwe partnered with us to make her community more inclusive, and to make transport more accessible. The promotion of health is important to her. As is arriving fashionably late. 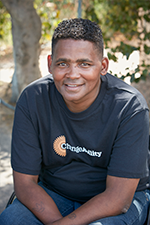 Ricardo partnered with us to change lives, inspired by how being a peer supporter changed his. He’s also hilarious and likes to distract everyone in important meetings. 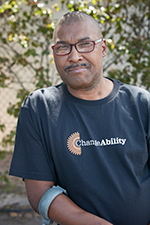 Salwen partnered with us to promote acceptance in his community. Interacting with people is important to him. He also works with the Franschhoek farming communities. We think he’d make a good politician – the caring kind, not the creepy kind. Cindy has a Doctorate in Psychology. She worked in academia but came to her senses. She wanted to help people – and to build ways to do it. She wants to establish an enduring organisation to create sustainable change. She’s particularly fond of fruit gums. Mariëtte has a Masters degree in Social Work. She provides training and mentorship to our peer supporters. Her areas of interest are integration and service delivery. She has a remarkable aversion to electronic equipment. It’s adorable. Candace has a Doctorate in Sport Science. Her focus is on the promotion of health, as well as raising awareness. She nails a weird, green smoothie every morning. 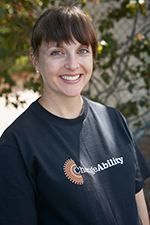 Marieda re-joined our team recently. She’s our go-to in the office. She does anything and everything she puts her mind to. She loves dogs. Like, a lot. We are ultimately governed by our volunteer Management Committee. Corporate governance and representation are enormously important to us. Remerta is a qualified CA and lectures in accounting. She makes sure we’re up to scratch with our finances and donors. She has a thing for Excel spreadsheets, which is completely bizarre (but very handy). 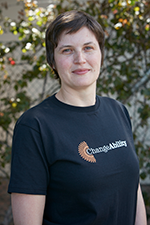 Hester has years of experience in the non-profit sector. 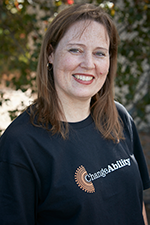 She strongly believes in lifelong learning, raising awareness and community involvement. She’s a complete over-achiever and speaks five languages. superpower is growing a whole human!